Yixing (pronounced as "ee-shing"), near Shangai, has a long tradition of the "pottery capital" of China. World's first teapots were created there during the Ming Dynasty (1368-1644). These distinctive reddish stoneware teapots came to be considered the "best vessel for brewing tea". 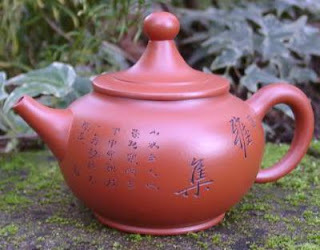 Yixing teapots are made from the special "Zisha" (purple sand) clay. They are not glazed. When tea is brewed in these teapots a tiny amount of tea is absorbed in the interior. Yixing teapot is never washed with soap...you just rinsed it withcold water. With continued use, a layer of tea sediment is formed.